.It seemed to Holly that all Rimmer had done since he had gotten back from his failed attempt to be a hero was complain about the latest crew member. He had been momentarily pleased by finding of Red Dwarf, although he pointed out that Lister still had to be court-martialled, and he was glad that Holly was back, even if that was only because of the advanced features that he could offer Rimmer as a hologram. The good mood faded once Rimmer was told about Kochanski. He had hated her since before the accident, and he didn't like the idea of her being around. He knew that Lister would start to put him down to impress her, just like he always did. He checked his book of space-corps directives (he *wouldn't* look stupid for getting the numbers wrong again! ), and informed the crew that Kochanski was from another dimension and had to spend 6 months in quarantine before she would be allowed to move freely in out dimension. Fortunately for her, he had respectfully withdrawn his objections when she pulled rank on him. "He's in there now, you know, trying to impress her." Holly did know, Rimmer had already told him. Holly decided to concentrate on something else. He decided to hum. He was half way through "Twinkle twinkle, little star" by the time he realised Rimmer was waiting for him to answer a question. "No! I can't!" Holly said, hoping it was another "can you believe it?" question. It seemed to work, and Holly could see that Rimmer was talking again. He carried on with his whistling. It was strange, thought Holly, but he was glad of his computer senility.3,000,000 years ago, he could have played every single song ever written in Stereo, listened to every crew member on board the ship moaning and pilot the ship at the same time. Now, he couldn't even hum a tune and listen to Rimmer at the same time. Thinking about this had made Holly lose his place in his tune, though, and as he was trying to work out where he was, Kryten came into the room. Holly knew what this meant. Ever since Rimmer had come back, he had agreed with Kryten on one thing: Kochanski had to go. Holly decided that he wasn't prepared to listen to the two of them sit and agree with each other, so he went to read the latest novel by "Agatha Christie". Again, Holly was glad of his computer senility. He remembered a time when he had to get Lister to erase his memory so that he could re-read a book. Now, thanks to his computer amnesia, all he had to do was wait a few weeks, and he had a brand new collection of books that he couldn't remember having read before! "I can't believe her!" said Kryten, "What does she think she's doing, distracting him like that? There I was, inviting Mr. Lister to help me do the laundry, and suddenly he's not concentrating on me any more! He's just looking at her chest! Is that really more enjoyable than folding sheets?" Rimmer remembered the time he had used Kochanski's disk to try to stop Lister from sitting a chef's exam. Before he'd gone back to his ordinary self, he'd managed to get a good look at.. ."Mr. Rimmer? Are you alright?" Kryten could see that his concentration was else-where. He hadn't had a proper conversation all day. The Cat had fallen asleep while he was talking to him, Holly had started humming out loud for no reason, and Kochanski started hitting him on the head with a chair legfor no reason at all in the middle of a sentence! "Yes, fine. I was just thinking, we're going to have to do something about them." "We can't have them being like this, can we? It's bad for the operation of the ship, it's bad for crew morale, it's a blatant violation of Space Corps directive no. 34124"
"I don't think they're that intimate, sir", Kryten interrupted, "and there is adequate gravity in the next room"
"You know what I mean!" snapped Rimmer. He could see that Kryten wasn't being convinced, so he decided on a different tactic, "And worst of all, poor old Lister isn't spending any quality time folding sheets or eating Vindaloo." "You're right!" said Kryten, "we must do something! But what?" Rimmer's first idea had been to show her those awful poems Lister had written. "Under pantski"? It wasn't in any dictionary that Rimmer had ever seen. Well, not except for Lister's big one (the one with all the naughty words underlined), but Lister had written that in himself, just to prove Rimmer wrong. "A good idea, sir, but she's already seen them", Kryten had told him. Rimmer tried to think of a time that Lister had done something really pathetic... then it hit him! Rimmer had a diary that he kept faithfully! 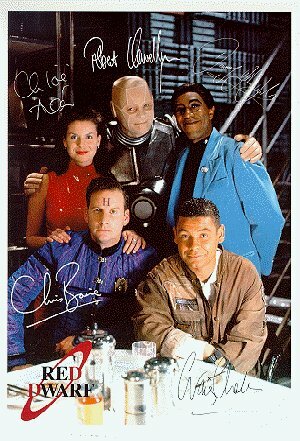 Every event that took place on board Red Dwarf was put into the one book! If Lister had done something embarrassing, it would be in there! Rimmer raced up to his quarters and opened up the diary. "Damn!" he said out loud. There were only 3 entries in the whole book, his own birthday, Caesar�s birthday and... and *that* day. Rimmer actually laughed (bitterly) at the irony. He had been looking for something that would embarrass Lister, but he had only found something that signified to two most embarrassing events of his life. There it was in front of him "Gazpacho soup day". As if the original Gazpacho soup event hadn't been bad enough (no-one had ever told him! ), he could remember the other event. The one that had made him tell Lister about Gazpacho soup day. Just as embarrassing, the time that he hadn't been able to get on with himself. The time that he had to ask Lister to turn his other self off, because he had been so cruel to him! Rimmer laughed again. This time, though, he was laughing in triumph. ---"Can you imagine it, Ma'am? For Mr. Rimmer to have been such a pathetic individual that he actually went into that girl's old room, just to be near the place where she used to live?" Rimmer was happy that Kryten was doing what he had said, but wasn't too happy about how far he was going. He was being really realistic. He was getting a bit worried, though. Someone listening might have actually thought that he *was* pathetic! Thankfully, Lister took the bite quickly, as Rimmer knew he would, and took over from Kryten. "Now that's pathetic!" he slurred. He knew that his speech was getting slurred, but he wasn't bothered. He knew that Kochanski was impressed by it. How could any girl not be impressed by someone who had drunk 6 lagers? "My God!" he gestured with his arm to emphasise the point the wasn't making, "If I was as path.. as pathetic as that, I... Whoops, are you all right? Where was I? Oh yes, I think I'd just have to kill myself! "He thought for a moment, then continued, "Yes! That's it! Rimmer, you're going to have to kill yourself!" Rimmer decided not to pick him up on the obvious mistake, but instead carried on with his plan, "I'll bet you're glad you're not that pathetic, aren't you!" "Damn right I am matey!" "Imagine how bad you'd feel if... let's say... you'd been snooping around in Ms. Kochanski's quarters after the accident. If you'd been... I don't know... looking through her underwear draw and looking into her private file she kept of all the dreams she'd ever had!" "I know! That would be smegging awful! I'd have to..." Lister thought for a moment, looked hard at Kochanski, who was smiling, enjoying the joke (and her Martini and Coke). He looked over at Rimmer, who was also smiling, but in a more gloating way. He looked back at Kochanski, who had seen the expression on Rimmer's face and who was now frowning at Lister. Lister decided to use an old skill that he had picked up from Peterson. Whenever Peterson had been getting into trouble when drunk, he'd hold his breath until he passed out. Seeing as Peterson was always drunk enough to be one step away from passing out anyway, this wasn't usually too hard. The others heard a thump as Lister hit the floor. -------------------- "But, if we add it to one of us in controlled doses, we'd be able to control it!" Kochanski explained. "Let me get a better look at that plan" said Lister"
"Again? Would you like me to put it in front of you?" "No, it's fine where it is. "It wasn't smegging fair, thought Rimmer, as he watched Lister's very un-subtle attempt to look down Kochanski's shirt. Not only was she no longer angry at Lister, she was giving dirty looks to Rimmer! "It was awful!" she had said, "Trying to put Dave down so that you'd make yourself look better in comparison! You have to try to impress people on your own merits, not by insulting your friends!" Rimmer's childish protests of "he started it" hadn't worked, and Lister played the part of being hurt by the dreadful slander so well that Kochanski had completely forgotten about what he had done! It wasn't fair! "Do you understand, then?" asked Kochanski, frustrated, "With this, we could get back to Earth in a matter of seconds!" "Right. I think I understand. Can I just get another look at that plan? "Rimmer hadn't heard Lister's last statement, he had been stunned by what Kochanski had said. Seconds? He realised that he should be involved in this plan. He was obviously the leader of this group. When they got back to Earth, Kochanski wouldn't be allowed onto the planet until she had completed her quarantine time, and Lister would be shot on arrival for losing a ship the size of a moon! "I can see you need my help" he said, moving over to their table and sitting down between Kochanski and Lister, "what's the plan?" Lister moved his chair over, putting it down on Cat's arm. Cat, who had been sleeping under the table, woke up and moved over to a cupboard. "Well, you know the virus that Lister contracted while he was" she winced, "well, you know the one I mean. The idea is that it turns whatever we're thinking about into something real. Now, if you or I or Lister were to contract the virus, we'd start turning anything we thought about into reality, but if Kryten were to contract it, we could tell him what to imagine, and we'd have whatever we wanted! Now look, if we get him to concentrate on this plan, we'd be able to make him conjure up a faster-than-light drive out of thin air!" "But he can't get a virus, he's a robot", said Cat from the cupboard, falling asleep as he uttered the last word. Kochanski realised that it was a valid point, and addressed her answer to the other two, "Kryten... my Kryten's brain was organic." "Yeah, so was ours, and we've still got the poloroids to prove it!" said Lister. "You've what?" asked Kochanski, but quickly realised from the leer in Lister's voice that she didn't want to know, "Never mind. My point is that if we injected the virus into his brain, we'd be able to make him think up this drive!" "But that's the 21st centaury Nosyarg drive." said Rimmer, thankfull that he could get something he knew into the conversation, "They proved that it wouldn't work, because it would need an almost infinite amount of power to get to the speed of light." "But none of those limitations apply here, because it's... well, the virus might not go by the normal laws of physics." "I think she's got a point" said Lister, "let me take a look at those plans for one moment." -- ------------------------ -Rimmer threw another mop out of the way to get through the doorway to the bridge. "How many of these smegging things are there?" he asked, impatiently. "Oh dear. I'm sorry, Mr. Rimmer, I don't know what came over me! There I was, thinking about the FTL drive, when all of a sudden I accidentally thought of cleaning up the bridge, and they all appeared." "Well, I don't think..." Rimmer suddenly disappeared from the view of the others, who were looking at him over a table. "You thought about cleaning the floor with soapy water as well, did you?" asked Rimmer from the floor." "Lay off him, man, it worked!" put in Lister. 10 minutes later, they were all gathered around the main controller. "Is this going to work, Hol?" asked Lister. He couldn't help but feel a sense of Deja Vu from the last time they had been standing around a controller that would take them home. He didn't like the idea of seeing Deb Lister again! "Why wouldn't it?" asked Holly, "It's all set up right, and you've got merunning it!" "What are we waiting for, then?" asked Cat. "Okay, ready to engage." reported Holly, "5, 4, 3, 2, 1... engaged!" The whole ship started to judder, and the stars flew passed the window. "How long is it going to take, Hol?" "Suddenly the entire ship glowed, and everyone felt far too hot. Just asquickly, it was gone. "What the smeg was that?" asked Lister. "We just passed through a star" said Kochanski, calmly, "it's perfectly safe, we're going so fast that it will have no affect on us at all. I was going to tell you, but I didn't want to worry anyone. "Lister heard Rimmer's Chinese worry balls, and decided to change the subject. "What do you think will be the best thing about getting back to Earth, Hol?" "They'll probably be able to fix my multi-tasking circuits. I used to be able to do over a million different things at once. Now I can't even manage two! Take right now as an example, I'm meant to be flying a ship, but I can't do it because I'm having a conversation with you instead! Once we get back to Earth, they'll be able to..."
"YOU WHAT???" Screamed Kochanski, "You aren't in control of the ship?" "Erm... oh yeah. Sorry about that." Holly's face disappeared, and then reappeared again, "does anyone have a watch?" "Well, I need to know how long we've been going for." "About 30 seconds" said Kochanski. "Oh dear." ----------------------------------- ---It wasn't fair! As a hologram, he knew that he'd survive for ever. Even if Red Dwarf had to carry on on a 3,000,000 year journey, he knew he would have seen the end of it, but this was worse! Holly had explained that the ship had been moving so fast that unless he could have the amount of time that the FTL drive had been engaged, to the nearest 0.000000000001 seconds, he'd have no idea at all where they were. He hadn't been running his own internal chronometer (he couldn't do that and run a conversation at the same time), and most of Kryten's systems had been off line, since he was getting over the virus. Worst of all, it was Rimmer's own fault for insisting that they leave immediately, instead of waiting until Kryten was ready to be working at full running order. He looked over at Lister, who was telling Kochanski that he would be able to work out what had gone wrong if he could get a proper look at the plans. He'd have to stop this. He'd have to stop his flirting with her. He had a plan! "Kryten! Follow me!"